There is nothing on this road for the next 170 miles. The thought of turning back to the last town didn’t even enter our minds. I’m not sure why that is. Maybe we just couldn’t accept the severity of our situation. We dreamed and planned too long for something like this to stop us now..
170 miles and the bike is running perfect. 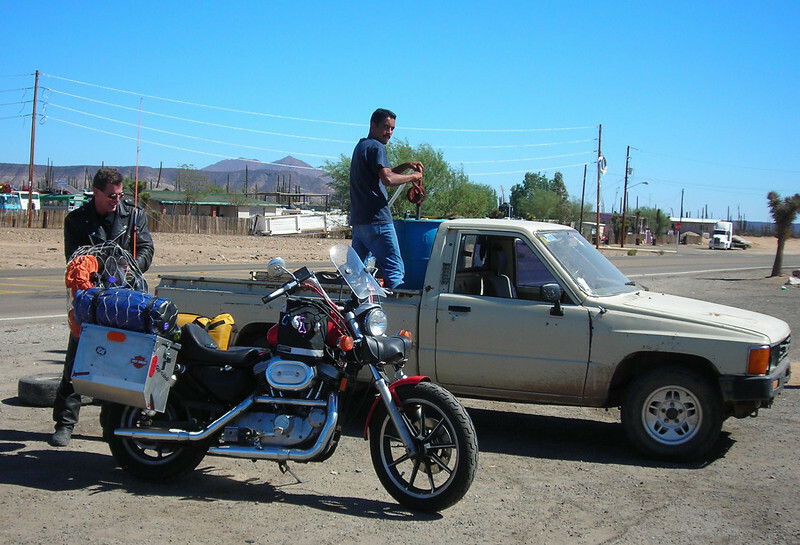 We make it to the gas stop and the road to Bahia de Los Angeles. After stopping and dismounting Heidi wanders off to some shade. It’s hot here. After filling up, Heidi walks back to the bike. I see a look in her eyes I’ve never seen before. She was ‘freaked’ to say the least. It started hitting me too. What is going on here. I think about the fried blinker wires we repaired in Yuma. I was just kidding myself thinking that had anything to do with the bike dying outside of Yuma. There is nothing hot on those wires unless it’s blinking and even then the blinker module isolated the wires from the battery. The worst thing that could happen is the module could fry and that has nothing to do with the bikes ignition.